Art Mentor. Looking for an individual to work with a young adult for 1 to 2 hours per week to cultivate his drawing talent. This young adult is gifted in drawing, specifically cartoon/comic, storytelling and poetry. Mentor would meet with the individual to see new work, share an art interest, explore possible careers in related art fields, and help give feedback. Mentoring location would be held at Advance Opportunities, 1401 Peterson Street, Marshall MN (located behind Hardee’s). Share Your Talent or Hobby. 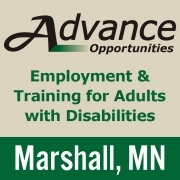 Advance Opportunities is looking for community members who would like to share their talent or hobby with employees in Marshall MN. Our hours are 9 am to 2 pm and length of presentation or sharing can vary based on person’s preference. Some examples: show some artwork you have made and share a couple tips on painting or drawing; perform your speech to an audience for more practice; share your gift of music or singing by performing for others! Open to ideas! jamie.struck@advanceopp.org if you can help.